1. When insert the memory card to digital camera, it pops up “memory card error” and you are unable to take or show photos any more. Other common memory card error messages are “card error”, “the card can not be used”, “Read error/write error”, “can not initialized” etc. If you do have important data on the card, stop doing anything on your camera’s card (do not format the card or take any more photos), you have to undertake the photo recovery first. There are many tools can help you. For example: Card Data Recovery for Windows (for Windows Users) or Card Data Recovery for Mac (for Mac Users). Connect the digital camera to PC to see whether it can be detected by PC with drive letter or not. If it is, use the photo recovery software to scan your memory card and get back the valuable data. If not, take out the memory card and connect it to PC with a card reader and then use the program to scan the memory card and retrieve data. After getting back the precious data, you can format the memory card according your camera manual. If the card can’t be formatted, try other available memory card in your hand to see whether it has the same scenario. 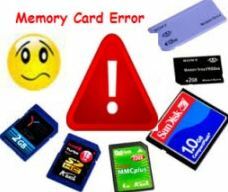 If the card does not display a “memory card error”, then the precious one is at fault. And you may have to buy other new card. If the data in the memory card is not vital for you, you can directly format it as the above stated. Note: You had better replace the frequently and long-time used memory cards with new ones for all typical memory cards have a finite lifespan, approximately 10,000 write/erase operations.The older ones are easier to get error. December 4, 2011 – Tenorshare Software, the professional data recovery software provider, today announce a special Christmas surprise for Tenorshare products lovers. From now to December 31, 2011, customers can get the bundle product which includes Card Data Recovery for Windows and Card Data Recovery for Mac with $39.95, which is to up to 70% discount to the original price ($19.95+$29.95=$49.8). Or get Card Data Recovery for Mac individually for $19.95, saving $10 compared to its original price. This promotion will expire on December 31, 2011. If you are interested in data recovery program and use Mac as well as Windows, This bundle is the perfect choice for it will save you a large amount of money. Card Data Recovery has won good reputation among users for the easy to use interface and powerful function. It has two versions specified for Windows users and Mac users. Card Data Recovery for Windows runs well on Windows7/Vista/XP/Server/2008/2003/2000. It supports file system recovery for Windows FAT12/16/32, NTFS, Linux EXT2, EXT3 and Mac HFS, HFS+. You can use it to help you recover photos, video, audio, documents from Windows hard disk, external hard drive, memory card, USB drive, floppy drive, pen drive, etc. Card Data Recovery for Mac runs well under Mac OS X 10.7 lion, Mac OS X 10.3 and above, also is compatible with the latest “Snow Leopard”. It allows you simply drag and drop the program into your computer’s “Application” directory. Largely shorten installation time. Meanwhile, you can preview the deleted data including photos, audio before recovery. Card Data Recovery is one of the significant products developed by Tenorshare Inc., which is the leading PC utility software supplier who is dedicated to developing excellent tools in the field of PC security and multimedia. We have developed a wide range of awarding-winning software including data recovery, PDF converter, video converter, etc. for home and business PC users worldwide. Our products have won excellent reputation among customers and we will continue to develop wonderful tools for Tenorshare products’ lovers.